Just because something is trending it doesn’t mean it will be timeless. The mullet was a thing in the early 1980s, yet you would be ridiculed today if you were to sport one. What holds true for hairstyles and clothing is also true in the kitchen. That’s right, your kitchen could be seriously outdated and it is time you moved on by giving it some updates. You may have not touched your kitchen since you bought your house or maybe you remodeled your kitchen many years ago, either way, you are so used to it you don’t realize just how dated it is. You can start by calling A Polished Finish in Atlanta and having new kitchen countertops installed. 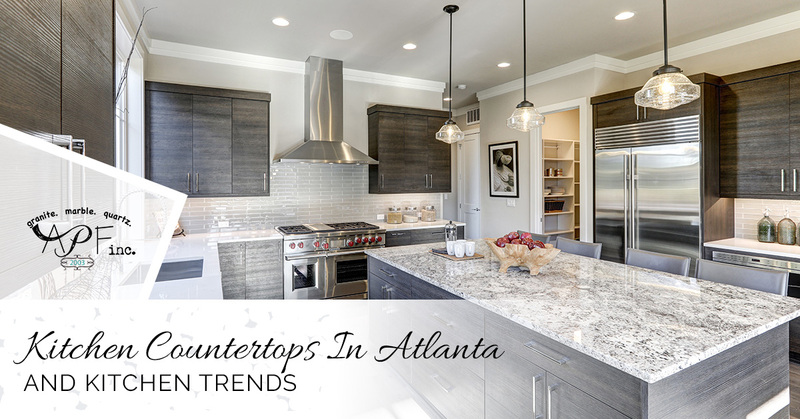 Here are a few more ideas on what is trending in today’s kitchens. Skip out on all of the scrubbing and sealing as quartz countertops require less upkeep than their granite counterparts. They also offer timeless appeal, people will love your quartz countertops years down the road. Quartz surfaces are less dominant than other materials, so you are less likely to grow tired of it. Take down those walls and banish kitchen isolation. It really does look as though open layouts are here to stay. People love informal dining and a comfortable space to cook, this supports our connected and casual lifestyles. Open kitchens encourage entertainment and interaction with others. Recessed lighting has been a staple in kitchens for several decades and they are likely here to stay. But the re-introduction of suspended lighting has embraced many homeowners. Especially homeowners who desire a quirky look in their kitchen. A stunning pendant light can express individuality and become the centerpiece of your kitchen. You have stylish plates, stunning glassware and a really neat set of mixing bowls, so why would you want to hide all of that in a cupboard? Many homeowners are finding ways to proudly display their attractive kitchen wares. Some are even installing wall racks on which you can display your silverware and utensils. And don’t forget to install a rack so you can display your wine glasses. If you love to cook and love cooking meals with the freshest possible ingredients, consider having an indoor herb garden installed in your kitchen. The convenience of having your basil, parsley and cilantro handy is easily affordable. This is not only a kitchen design trend, but it is also a cooking trend as well. You will love the lush presence that it provides your kitchen while adding a dash of nature in an otherwise enclosed and sterile environment. You have probably seen your fair share of white or off-white kitchens with non-descript countertops and boring backsplashes. Homeowners are now opting for a splash of color here and there to spice things up a bit. This is done by adding backsplash motifs, accent walls and colorful accessories. The possibilities are endless. Add an exotic note to your kitchen decor with intricately patterned Moroccan and Spanish inspired tiles. These make a huge visual impact and speak volumes about your personality. Stainless steel appliances are a design trend that is seen all too frequently. Basically, they are everywhere. So it is time to say goodbye to stainless steel and replace them with appliances with standard neutral tones or you can go wild with colorful and patterned appliances. Hardwood floors have been keeping kitchens looking and feeling warm and cozy for years and this isn’t going to change anytime soon. Hardwood floors adapt well to any type of kitchen plan and are easy to maintain. When it comes to kitchen sinks, there is an emphasis on function. Homeowners are choosing big sinks that can accommodate large pots and pans and other wares that require hand washing. Upper cabinets are starting to disappear, opening up the upper part of your kitchen. So storage has shifted and undercounter appliances have emerged as favorites. Microwave drawers load from the top for easy convenience. If you are ready to update your kitchen, give A Polished Finish a call.